This is a pendant jewel, which would have hung from a chain. 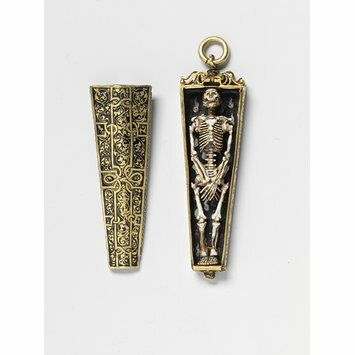 It is a powerful example of a type of jewellery known as memento mori (roughly translated from the Latin as 'Remember you must die'). The skeleton and coffin reminded the wearer that death, and therefore judgement, were certain, and so it encouraged a virtuous life. 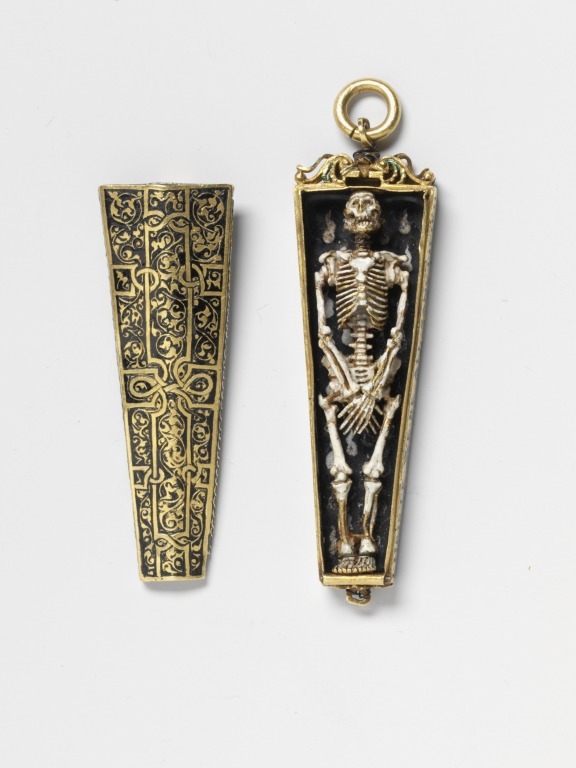 The inscription, however, shows that the wearer believed that we need not fear death. It states boldly in English that through Christ's resurrection - his sacrifice on the Cross and his rising from the dead - we are all 'sanctified' or made holy. His death takes away our sins. In 1856, when the V&A bought the jewel for £21, it was believed to have been found in the grounds of Torre Abbey, Devon. However, this does not mean that it had any connection with Torre Abbey when it was a monastery. Henry VIII ordered the Dissolution of the Monasteries (their closure) in the later 1530s, and the jewel appears to date from no earlier than the 1540s. Parts of the abbey were in due course converted into a private house. We know nothing definite about the history of the jewel until the V&A acquired it. It was probably sold by the Cary family who lived in the house from 1662 until the early 20th century. Memento mori pendant, in the form of a skeleton in a coffin. Gold, enamelled in white and black, with the remains of opaque pale blue, white, yellow, translucent green, and dark blue enamel on the upper scrollwork.